I would love to have an Ampzilla from GAS, it was a Jim Bongiorno design. One of most musical amps to come out of the late 70's IMHO. Also an Amber model 70 is on my amp bucket list. I want one of those for my collection also. You are very welcome to one but I think the postage cost from England would be ridiculous. Factor in that it's not just England. I'm on the Isle of Wight which means an extra boat trip. If you need it my post code is PO33 2SE. I think our Martin B115 cabs had XLR connectors and I had a pair of Peavey speakers fro the 1990s which had XLR and 1-4" jacks. My Martin 115's had XLR connectors as well. This was in Canada. When I started in the biz I thought 1/4" was normal. XLR was considered "Pro"
I seem to recall the Martin Phillishave setup had XLR (one way) on the bottoms, XLR (other way) on the shavers, and 1/4" on the horns. At the time, I figured a pretty foolproof setup. Then God made a better class of fool. Oh well. That might be the way we were setup too. Definitely 1/4" on the highs but I can't remember whether the mids were opposite the bass. That system was quite popular in the outskirts of the city, for many years. i mixed on many of them. Always wired the same. Often had CS-800 for power. Gotta admit, dumping the MK-111 or MD something and putting in my Yammi always made me smile. Good, dependable rigs. Had a GAS preamp (Thalia I think) in the '70-80s until I got my ML7. Good sounding and well made stuff. I did bring home an Amber amp to try and it was a bit blurry. That warm and fuzzy sound similar to late '70s Marantz. 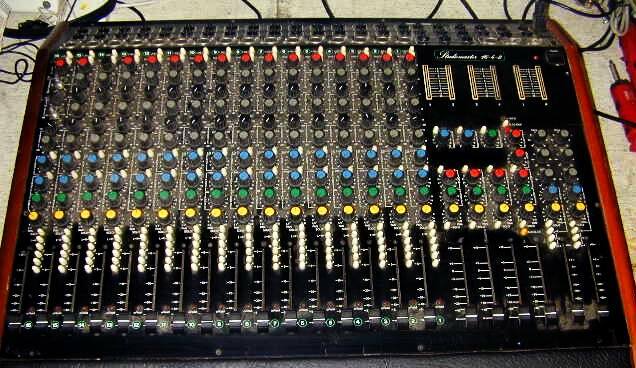 I started with a 16 channel Studiomaster. Hey, that's my old console! Well, it looks just like it, anyway. The Series One 16-4-2 was my first console of any consequence until it got stolen, I then got another and added the 4 channel expansion unit. Oddly enough one of them had the L-R numbering, the other had R-L... can't remember which was which as that was WAY too many brain cells ago. Seems like you could order a numbering kit for them, I always suspected that a previous owner had done exactly that. Had lots of great gigs on those boards. I just guessed at a weight of 50lbs and it looks like around $400 US from you. That is a bit more than I am willing to part with.